On February 5th, 1944, the crew of the ‘Star Valley’ B-24 Liberator were on their way home (Shipdham, East Anglia, England) from their eighth of 25 scheduled missions, bombing a Renault works manufacturing plant near Tours, in the Loire et Cher region of France. They were attacked by a wing of FW190’s and the ‘Star Valley’ was shot down over the French town of Saint-Léonard-en-Beauce. Only one of the crew survived the crash. German troops forbade villagers from going near the wreckage in their attempts to bury the bodies. After a week, the Germans transported the mens’ remains to the nearby town of Blois where they were buried in Wehrmacht-issued coffins at the local Catholic church. Upon hearing of the burial, the mayor of Blois arranged for a religious funeral for the men — an act of defiance that landed him in a German detention camp, where he died. A Blois factory-worker who took up a collection of money for flowers to throw on the men’s graves was also arrested and jailed. Warren Klein, the only survivor, managed to land in a disused quarry and was discovered by a villager, Mr. Leroux, who took him to his residence to clean up his wounds. Only a short time later, the Germans arrived and arrested Klein, taking him to the hospital in Blois before moving him to a prisoner of war camp in Sagan, Poland. He was transferred to two more P.O.W. camps afterwards, before being liberated on May 1st, 1945. Warren returned to the United States and eventually married, having a family with three daughters and two sons. Every year, the villagers of Blois congregate to give thanks to the Americans who gave their lives to liberate their country. 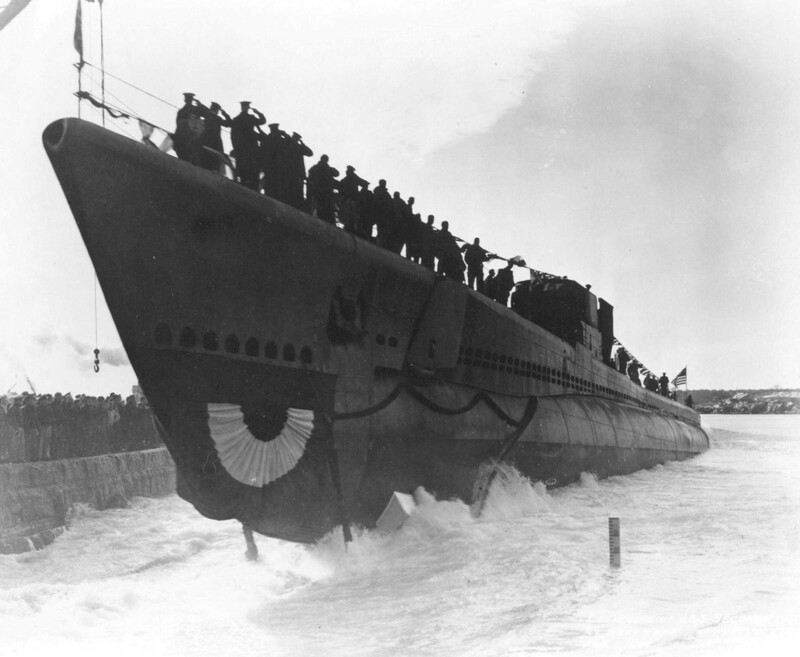 Launching of submarine Segundo (SS-398) in Portsmouth Navy Yard, Maine, United States, 5th February, 1944. 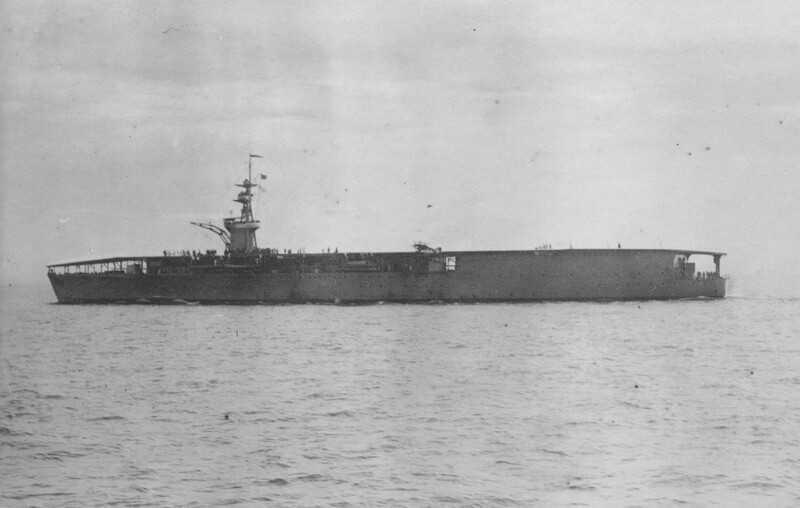 USS Alaska (CB-1) firing her 5-inch gun during gunnery practice on 5th Febuary, 1945. 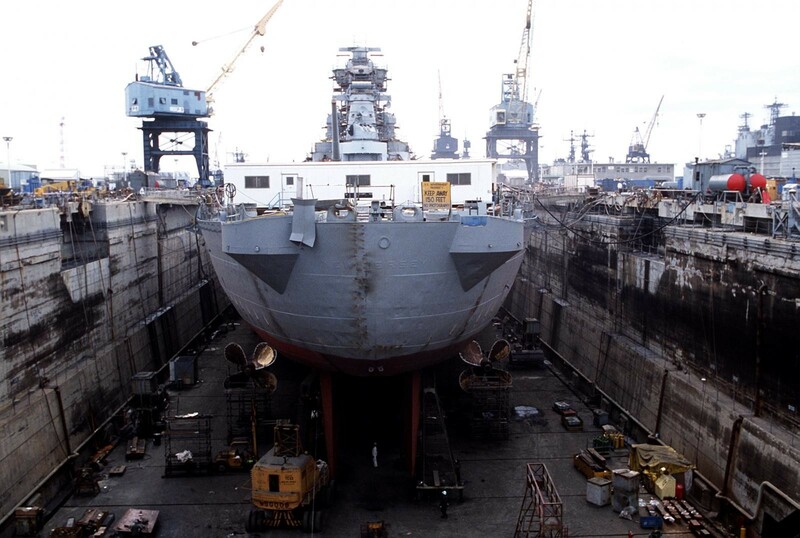 Stern view of battleship New Jersey in drydock while undergoing refitting for reactivation, Naval Shipyard, Long Beach, California, United States, 5 Feb, 1982. 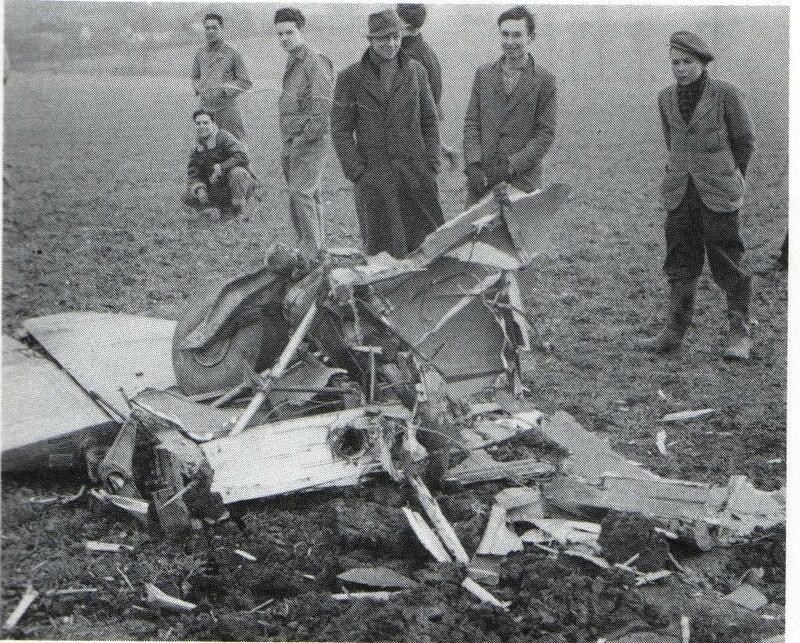 The remains of Mosquito HK454 (RA-L), which crashed during a test flight today in 1944. The following is his retelling of the crash, followed by the poignant log entry. 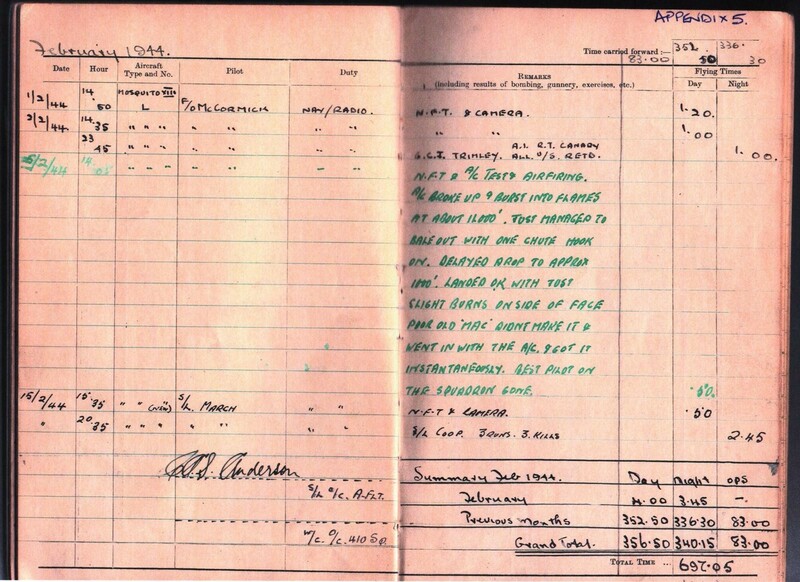 “On the 4th February 1944 we took off from Hunsdon on an air test flight as we had a little engine trouble with the starboard engine. We went up to 13,000ft to give the engine a full run up and test. Mac (F/L McCormick), completed the test and he seemed satisfied as he then said “ok , thats fine, lets go home”. He then did a starboard wing over and put the nose down in the usual way of quickly losing height. After losing 2-3000ft Mac pulled out of the dive, there was an almighty bang right under my backside and I was flung to the floor. Mac immediately leaned over me and attempted to jettison the door which was on the starboard side. Then the starboard wing, outside of the engine collapsed and I think it took out the side of the nose. The engine caught fire and we started to go down in a tight spiral. I saw my parachute roll over the floor towards the hole and I just managed to grab it. Clipping it on I tried to get out through the hatch but the centrifugal force of the spin held me for what appeared to be ages but I suppose it was only for seconds”. “I then found myself in the air, conscious of the fact that the aircraft was falling above me, burning and raining bits down onto me. I do not really remember much after this, except that somehow I must have hung onto the parachute. 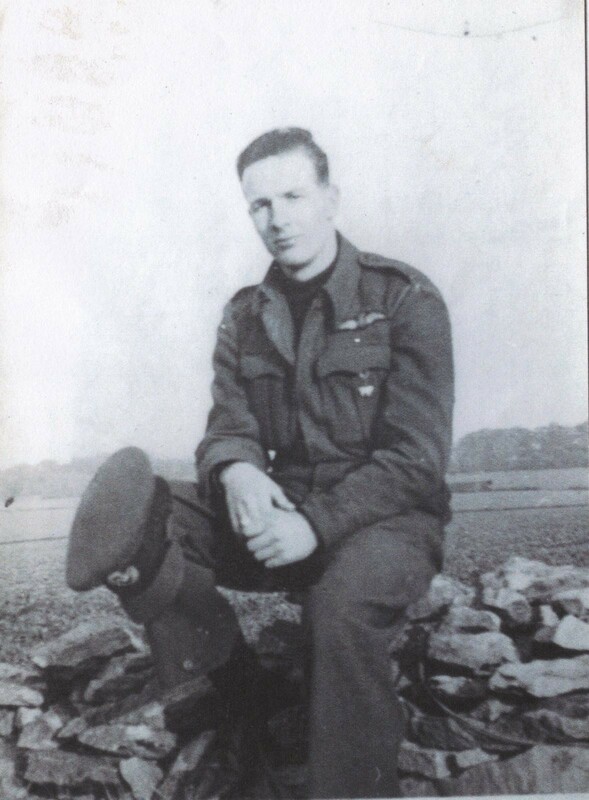 It seemed that as soon as it opened I hit the ground and the burning mossie landed nearby, about 100 yards away”. “I managed to get out of the harness and ran towards the aircraft, but someone got hold of me, kept me back until the accident and ambulance services arrived to whisk me away. Later on the way to hospital, the doctor told me that Mac hadn’t made it. He had been trapped in the aircraft and did not survive. I discovered later that my parachute and harness had been recovered and only one retaining hook was attached to the harness and I was indeed lucky to escape with a few burns. Sadly I lost a friend and a mate”. “At the accident bard of inquiry I stated that in my opinion the aircraft’s main spar had broken as we pulled out of the dive. The investigators and the De Havilland representative both indignantly stated that ‘this was not possible’. They implied that Mac had undertaken unauthorised aerobatics, which I strenuously denied”. “Many years later I was told by a friend, (who was qualified to say so), that there had been similar accidents. The cause was found to have been water seepage into the main spar which weakened it to breaking point”. The words on his grave read, “Not under maple trees, but under English skies, one of Canada’s sons lies”. Great photos and retelling of Mac’s story. Thanks, Jeff. I think there is something special about the ‘Star Valley’ and McCormick memorials, heartfelt tributes to men who came a long way to fight for people they didn’t know. Tremendous. Great and touching stories. Yes, two very interesting stories.